Finding blessed inevitability and surrendering to the Mass is what many find most attractive about the Extraordinary Form of the Mass. Time tested over centuries, fifteen centuries in the case of the Canon, the Latin Mass is simply a more perfect way to worship. Whether one assists at the most beautiful of High Masses, or at the most humble of Low Masses, a palpable sense of the sacred and eternal is evident in every reverent moment and movement. It is most likely the case, however, that the majority of the faithful who attend the traditional Latin Mass were first introduced to their faith through the Novus Ordo, what is now called (since Summorum Pontificum) the Ordinary Form of the Mass. Unfortunately, these same Catholics have often spent years subjected to intentionally profane liturgies that are commonly devoid of reverence and beauty. This anthropocentric liturgy is identifiable in parish after parish, and diocese after diocese, by the very manner in which churches have been designed in the post-conciliar era. Often now a Presider’s chair sits in place of the tabernacle; Our Lord instead relegated off to the side, sometimes even removed from the sanctuary altogether. The choir, or the “praise and worship” band, is now commonly situated upfront, so that the altar (no doubt a table) has to share our divided attention with secular instruments such as drums and guitars. Religious art and Catholic statuary serve no purpose, and therefore have no place, in these architectural expressions of the modern iconoclasts. Those who defend the Ordinary Form most vociferously against criticism will often explain that their parish is blessed with a solid, traditional, priest who offers a “truly reverent” Novus Ordo Mass. The truth is that the very need to even provide such a qualifying statement largely makes the case for the superiority of the Extraordinary Form. In The Heresy of Formlessness, Martin Mosebach noted that the “liturgy’s death knell is sounded once it requires a holy and good priest to perform it.” Sadly, that is the case with the Novus Ordo and I don’t believe many would dispute it. Posted on December 22, 2014, in liturgy and tagged cardinal joseph ratzinger, extraordinary form of the mass, latin mass, Peter Kwasniewski. Bookmark the permalink. 12 Comments. Brian, it must be a “God thing” that you explained so carefully the lesson of the Golden Calf this morning, and that same event was what I read last night before sleep. May God’s blessings continue!! Thanks once again. yawn…..any testimony to the “beauty” of the EF rings shallow & hollow when the author can’t stop themselves from using “Novus Ordo”. More traddy preening and sneering will never expand appreciation of the EF, or even make those who hunger for solemnity & beauty in the OF look to “traditionalists” for guidance & insight. Thank you for your comment John. If you notice, I use interchangeably the terms Novus Ordo/Ordinary Form and Traditional Latin Mass/Extraordinary Form. I do this because different audiences utilize each of these four terms…and I am writing to reach them all. For the record, I know of diocesan priests who frequently use the term Novus Ordo. Some of these very same priests ONLY offer the NO/OF. Please recall, the terms OF/EF have only been in use since 2007. I would ask you, time permitting, to read a few of my other posts. I always attempt to explain the beauty of the traditional liturgy on its own merits, and through a historical and theological perspective. I’ve also included guests columns from diocesan priests arguing a similar perspective. I firmly believe that the EF best presents what is true and beautiful about our Catholic faith. Thank you again for your feedback and Merry Christmas John! I have nothing against the so-called Ordinary Form or Novus Ordo liturgy per se. Served by a properly (theologically) formed priest, it can even be a beautiful service. I have, however, a great deal against the OF/NO as (mis) served by most RC priests these days. Their repeated and manifold failures to adhere to liturgical law as expressed by the Magisterium or in Holy Tradition are an occasion of great sin in me (namely, rage), and are nothing less than sacrilege on their part. This is but one of the many reasons why I have absented myself from the RC Church, and have become a communicant and a member of the Eastern Catholic Church. When your Church manages to get its collective act together, I might think about occasionally attending. Until then, Blessed Sacrament Church (Dominican, Seattle WA) is the only RC church that I have been able to attend without a feeling of great rage and pain. A pity that I live about a thousand miles away from it. It seems to me that there are several problems with the views expressed in this post. Extensive use is made of quotations from Benedict XVI, but your conclusions both here and in other posts are very different from his. Consider Benedict’s “Meeting with the Parish Priests of Rome”. This was one of his last public appearances, in which he summarises and clarifies his attitude to several controversial areas. The address is short and written in an accessible style, and ought to be read in its entirety: http://w2.vatican.va/content/benedict-xvi/en/speeches/2013/february/documents/hf_ben-xvi_spe_20130214_clero-roma.html (sorry, I don’t seem to be able to insert a hyperlink). It is very clear both from this document and his pastoral practice that BXVI regards the authentic liturgical reforms as positive developments. He is in favour of dialogue, of the use of vernacular, of the expanded lectionary and of active participation. His respect for the Missal of Pius V is clear, but nonetheless he charitably points out its faults, eg the gulf between the liturgy of the altar and the liturgy of the people. This flatly contradicts Dr Kwasniewski’s views as you quote them. The liturgy of the altar changes from season to season and from day to day; the traditional devotions of the people were always the same because they were not participating in that liturgy. If you were in Rome on pilgrimage and needed to eat, would it be better to go to McDonalds because the food is always the same, or to look for a family trattoria where fresh, seasonal local ingredients could be tried? Sorry Dr K, but I’m with Benedict. It’s true that Benedict is critical of what he terms the misunderstanding of the principles of liturgical reform. His example is that proclaiming the scripture readings in the vernacular doesn’t necessarily imply that we can understand them immediately. But Benedict’s solution is not a return to the older way of doing things, but rather ongoing formation, ie he accepts the liturgical reforms and wishes to build on them. To summarise, Benedict says that the older form of Mass was good but had limitations, the newer form is better but its practical application has been limited by misunderstandings and distortions which need to be corrected. He gives no indication that the liturgical reforms should be reversed, or that there should be a wholesale return to the Mass he renamed as the EF. 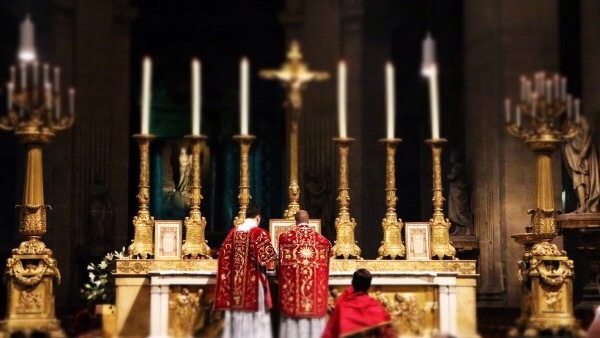 In this blog you point out the benefits of many traditional aspects of the liturgy, ceremonial, orientation, latin, kneeling etc. There is no doubt that Benedict would agree with much of this, but his approach is a careful and intelligent use of these in the OF where they are appropriate. It’s clear from your posts that you regard BXVI with respect; should you not allow yourself to be taught by him? Thank you for a very thoughtful comment Frank. You bring up many good points. In assessing the pre-conciliar and post-conciliar liturgies, their strengths and weaknesses, I believe that we all might be of similar opinion (you and I, as well as Benedict and Dr. Kwasniewski). I do believe it’s reasonable, however, for someone of good will to look at the liturgical reforms of the post-conciliar years, beginning with the Novus Ordo Missae itself, and then including the various innovations of the last forty years, and determine that the organic development of the old rite, as well as its stricter rubrics, one year lectionary, use of Latin, prayers at the foot of the altar, offertory prayers, etc. all make for a “more perfect” liturgy. I agree that our pope emeritus doesn’t see it this way, but he none-the-less understands the failure of the Novus Ordo (in practice) to be what so many want it to be in theory. Thanks again for taking the time to provide your thoughts on this incredibly important topic. It’s important to be clear that these thoughts were Benedict’s opinion, not magisterially binding teaching. Summorum Pontificum has legal force in that it mandates every parish to offer the old “form” but it by no means imposed on us this new naming scheme. The question that Klaus Gamber raised by asking if we created a new liturgical rite hasn’t been answered yet. As someone who has served at both masses, I’ve had a chance to participate closely in the ritual of both “forms.” The Novus Ordo is essentially a stripped down TLM. Many parts have been removed, other parts made optional, and more arbitrarily changed. This wasn’t the answer, education should have been the answer, because all of those prayers and rubrics that were removed did indeed have meaning. Even the silence had meaning. Benedict sees the problems in the Novus Ordo but he never went so far as to really make the changes he theorized. For example, making it explicit in the rubrics to say Mass facing ad orientum, correcting the allowance of girl altar boys, or enforcing greater use of Latin in the rubrics. For Benedict reverence is only an option, the “Extra-Ordinary form” still another option, but saying mass facing the people with guitar’s and tamboreens also is another option. The problem with this line of thought is that it bends the Mass to the personal preferences of the people and the priest instead of the Mass being a cult of worship which we should be conforming ourselves. It really represents a spirit lacking in discipline, and brings to mind the people who condemned someone like John of the Cross who was condemned because he was trying to bring back discipline to his Order. Anyone who’s done the most basic amount of research about how the NO Missal came about would not attempt to refute Mr. Williams most generous approach on this subject. Once the truth is known, one could handle the subject with much greater abruptness; yet Mr. Williams still chooses gentleness. —-He is being taught by Benedict XVI, see my quote above.